A Gaia science alert was triggered on 2016-08-05 when the object Gaia16aye (19:40:01.13 +30:07:53.4, J2000) was found 1.2m brighter than during previous Gaia observations (the latest of which was conducted on 2016-06-20). The previous 22 Gaia detections of the source (starting from 2014-10-30) show no variability greater than 0.05m RMS. Follow-up ground-based observations started on 2016-08-09 reveal a red source (V=14.9, B-V=1.6) gradually brightening at a rate of about 0.1m/day without changing its color and showing no fast variability (apart from the long-term brightening trend). The observations obtained on 2016-08-13 show the object reached V=13.8 (B-V=1.6) and its brightening rate increased to 0.6m/day. The photometric measurements were conducted with the 0.6m telescope of the SAI Southern Station in Crimea, the pt5m telescope at the Roque de los Muchachos observatory on La Palma (Hardy et al. 2015, MNRAS, 454, 4316), the 0.8m telescopi Joan Oro at l'Observatori Astronomic del Montsec, the 0.6m Akdeniz Univ. UBT60 in the TUBITAK National Observatory, Antalya, and the 0.8m telescope at Serra La Nave. 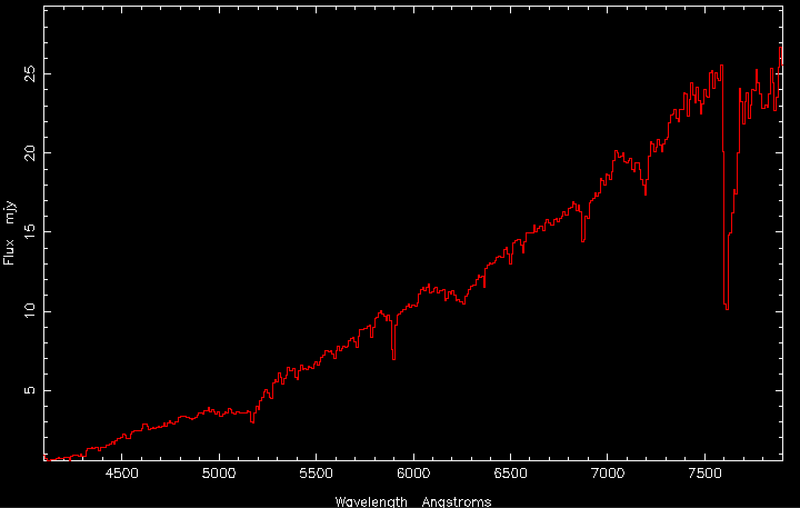 The combined lightcurve can be found at http://scan.sai.msu.ru/~kirx/ATel/Gaia16aye/ The spectra of Gaia16aye obtained with the 1.22m Asiago telescope on 2016-08-11 and the 2.0m Liverpool Telescope (La Palma) on 2016-08-12 are consistent with a normal K8-M2 type star. No emission lines are detected. Inspection of 159 unfiltered images of the NMW nova patrol archive ( http://scan.sai.msu.ru/nmw/ ) obtained in 2011-2013 indicates that the object was always fainter than a nearby V=14.2 star. The physical nature of the flare remains uncertain. The lightcurve shape showing an isolated brightening event is unusual for red irregular variables which typically have lightcurves showing a series of waves of changing amplitudes. The possibilities of a FUor/EXor young stellar object flare or a cataclysmic variable are not supported by the absence of emission lines in the spectrum. An absence of emission lines would be consistent with an FU Ori event if the absorption lines were broad and correspond to a higher temperature, which is not observed. Many cataclysmic variables show strong Balmer absorption lines during outburst while others show emission - the effect may be inclination dependent. Strong Balmer absorption is not observed in Gaia16aye: EW(Halpha) ~ 1.1+/-0.1 A. A bright microlensing event like the one discovered by A. Tago on October 31, 2006 (CBET #711, #718; Fukui et al. 2007, ApJ, 670, 423; Gaudi et al., 2008, ApJ, 677, 1268) is not excluded, but a well-sampled long-term lightcurve is needed to test this possibility. If the star is a nearby red dwarf rather than a distant giant, the probability of a microlensing event would be low. We encourage further observations to determine a nature of this flaring object. Archival information about (non-)variability and spectra of this object in the past would be also very valuable. 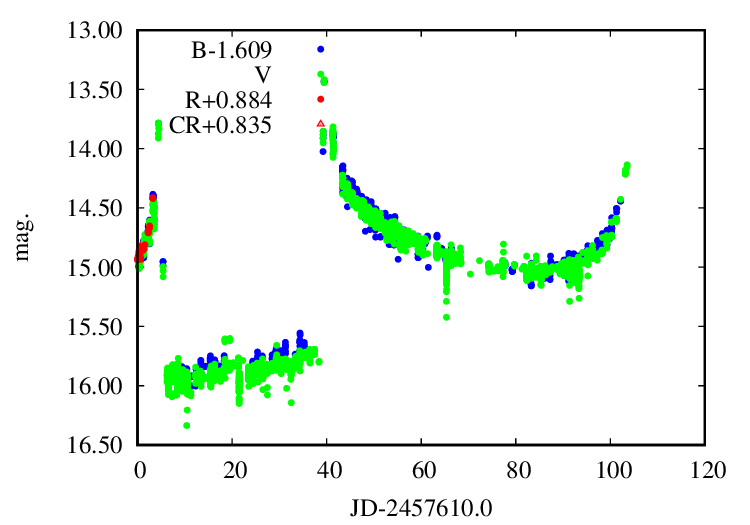 The photometric calibrations for the pt5m, Joan Oro, and UBT60 observations were obtained using the Cambridge Photometric Calibration Server (CPCS), designed and maintained by Sergey Koposov and Lukasz Wyrzykowski. We acknowledge ESA Gaia, DPAC and the Photometric Science Alerts Team. 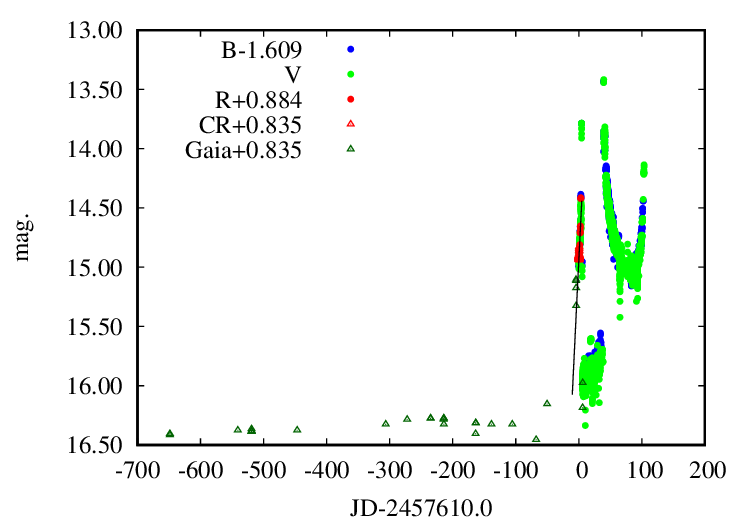 The lightcurve plots below present a summary of ground-based follow-up of the flaing object Gaia16aye (including the time after ATel #9376 was posted). 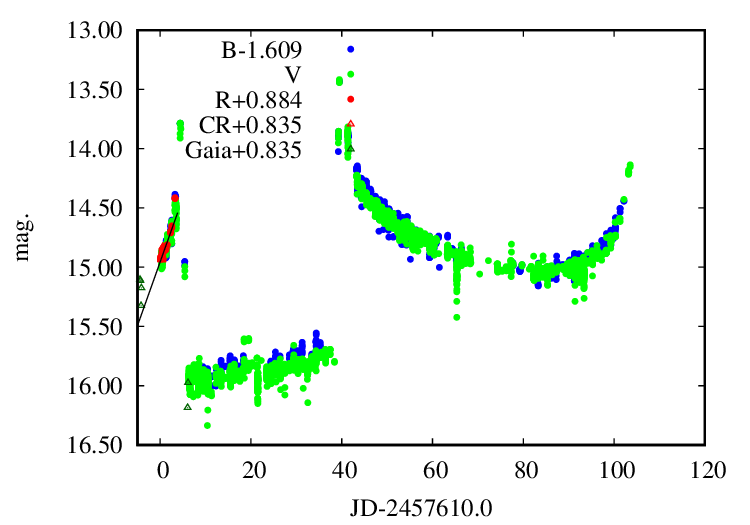 The combined lightcurve of Gaia16aye. The black line indicates the 0.1m/day brightening trend inferred from ground-based observations on 2016-08-09/11. Note that the offset between Gaia and ground-based V-band measurements is uncertain as the object is very red. 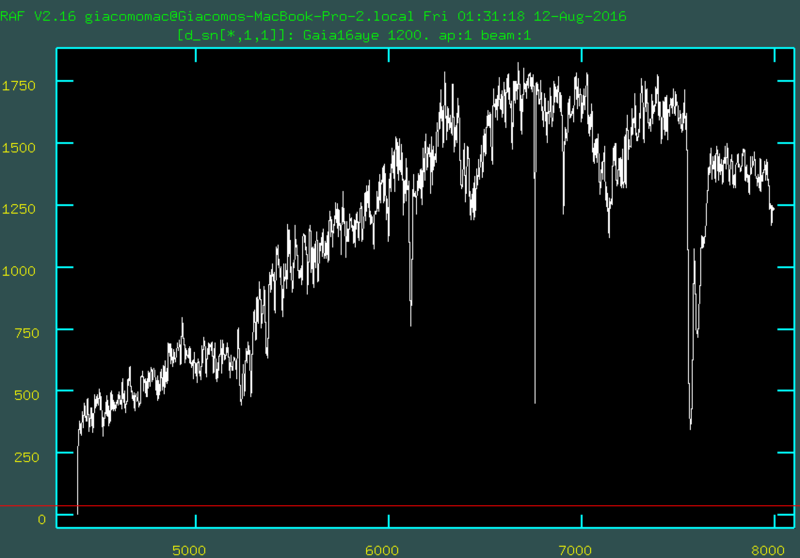 The combined lightcurve of Gaia16aye zoomed on the current flare. The spectrum of Gaia16aye obtained with the 1.22m Asiago telescope on 2016-08-11. No flux density calibration applied before producing this plot. The spectrum of Gaia16aye obtained with the 2.0m Liverpool telescope on 2016-08-12.